A powerful way to live your dream of RVing full time. Have you had the longing to live in the great outdoors but could never do so before retiring? Does a sense of adventure call to you, but you feel like you are constricted by your Social Security checks to live a good life? Are you contemplating living the RV life or are about to begin doing so? If that is the case, then this will be the most important message you might ever hear. 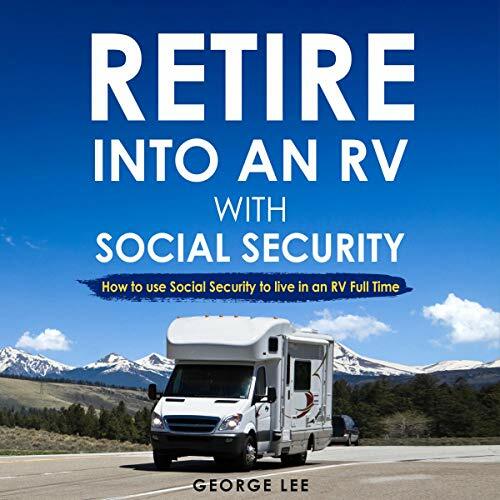 I, George Lee, will share the secrets of RVing full time on just your Social Security income. That’s right folks. You can actually live a much better and fulfilling life in an RV, using just the Social Security checks you receive every month. In fact, there are many others, including me, who are doing this right now! This audiobook has been designed to guide you through the process of RVing full time on Social Security, start to finish. No need to do research. Just jump in. Every day that you spend in the “sticks and bricks” life is another day that you waste your hard-earned Social Security money on a lifestyle that leaves you unhappy, unsatisfied, and strapped for money and opportunity. Take action now and buy this audiobook! Clear information about RV living. Have become very interested in the possibility of full-time RV living (wife is not yet convinced). Of the many books we've read, this one was not only written in clear language but is extremely informative and educational. With the information and guidance offered by the author, we are feeling a lot clearer about a decision - still have a lot of homework to do. If you want good, clear information about RV living, this is the book! Very practical and useful advice. Very practical and useful advice, even if you are not at or near retirement but thinking about living full-time (or even part-time) in an RV. One thing I have not seen addressed in this or any other book so far when evaluating what state should be your legal domicile is the issue of death with dignity laws. I found a few suggestions and some information I had not thought of or read about elsewhere. Some of the information is the same as you will find in many other books on the subject but this one seems to go into more detail in some areas. I'd like even more detailed information about boondocking, technical aspects of various RV's and the systems in them, adding solar panels, etc. This book was wonderful. I highly recommend anyone planning to make the leap from 'bricks and sticks' to a fulltime RV lifestyle, that you read this book first!! The book was an easy listen with lots of good information. I think I enjoyed it more because the author shared his RV lifestyle rather the just information. I've already recommended this to a friend. I passed another book to a friend but will keep this one because of the great information. My husband and I are just beginning to explore the possibility of the RV lifestyle, at least part-time, for retirement. This book delivered a lot of information in an interesting and enjoyable way. It’s definitely worth the read and also points you to a lot of additional resources to continue educating yourself. You won’t be disappointed! Very helpful and interesting book. I enjoyed reading this from a full-time RVer's perspective. Vacationing from time to time in an RV and living in one full time is very different. Very informative and brought many different aspects of RV'ing to my attention that I never thought of. Highly recommended! A terrific book, makes you want to get out there now (not later) to enjoy the R.V. life. At least the book certainly convinced my spouse and me and we had our concerns. Answered all our questions and addressed things that had never occurred to us. The writing style is a little bit folksy but there is lots of valuable information, particularly about tax and health coverage considerations. Definitely useful for those of us who are considering this lifestyle. You can tell the author loves the RV life! Basically, the author is not trying to convince you to live the RV life. He is laying out the pros and cons with the idea of the reader checking to see if the RV life would work for them. He does a very good job of laying out the options for your consideration.